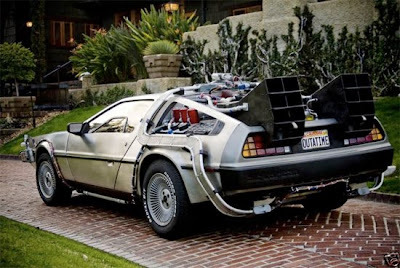 Science Fiction Geeks - Scifi News: Own a Back To The Future DeLorean - only $89,000 on Ebay! 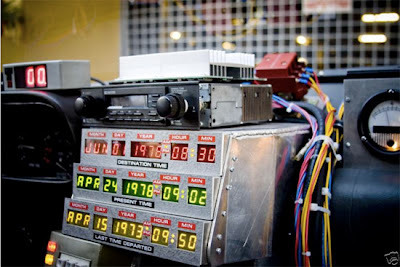 Own a Back To The Future DeLorean - only $89,000 on Ebay! Someone who apparently has a lot of extra time and money on his hands built and is now selling on Ebay, "the most screen accurate Back to the Future Delorean Time Machine replica to ever appear on eBay." With a look at the photos, I'm amazed at the level of detail put into the car! Built on a beautiful, super-clean, stock 1981 5-speed manual transmission DMC-12 with over $16,000 of mechanical work and upgrades performed at DMC California in September of 2008. Approx. 78K miles on vehicle. Programmable time circuits which function just like those in the film. Functioning digital speedometer on the dashboard (reads actual vehicle speed). Main Time Circuit switch functions just like in the film, with all sound effects. Sound effects for door openings. Includes “Plutonium rods,” which can be loaded in to the “reactor” on the rear of car, just like in the film. Custom “95 MPH” in-dash speedometer like the one mocked up for the film. The stock Delorean speedometer only goes up to 85MPH. Screen-accurate “OUTATIME” metal-stamped license plate with 1986 registration tag. Eagle Goodyear GT tires, as seen in the film (not pictured). And what a deal: it'll only cost you $89,000! If you have that much to spend on a movie-replica car, here's the auction link [link]. The auction link also has more photos!